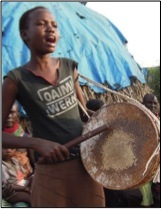 Emuriakin, in the Turkana language, means forgotten. And that’s exactly how the people of the Nabang’keny location in Lokichoggio felt. Forgotten by authorities and NGO’s. No school, no water, no support to get out of poverty and dependency. And Emuriakin, that’s simply how they called their village. But in November of 2009 a spark of hope was ignited with the groundbreaking ceremony of the Hannah-Emuriakin School. This was also the start of a long-term commitment, which today embraces some 4-5 larger projects plus a number of smaller ones, bringing hope for a brighter future in a region where scarcity and poverty is the norm for a majority. Everyone who has been involved in the Emuriakin-Projects this last year, whether in support and fundraising or in the field in Lokichoggio, Kenya, has a real reason to rejoice with thanksgiving when looking back at how the activities have touched a considerable number of people. Gifts and regular project support 217 000 USD. A more detailed Financial Report is found at the end of this document. The Hannah-Emuriakin-School both the ECD and the Primary School can continue to operate thanks to an increasing number of supporters and a total of 450 students have attended the school with 20 staff and teachers. The wonderful, 24 meter long green house produces tomatoes and other vegies, which add great nutritious value to the school lunch. Besides the regular support of the school, there have been significant improvements through the construction of the Birgitta Hall (assembly hall), installation of electricity both from solar and grid, building of showers, improved school desks etc. etc. A number of volunteers have also contributed at various times both with practical work and pedagogic assistance at the school. In the Women’s Project, which continues to develop, there are 21 women and 1 man involved in 3 different businesses, a bakery, a shop, the ANA Shop & Café and a Beading Business – Shanga. The shop was opened in March and Mrs Sara Ngasitae has been appointed manager of the ANA Women’s Group. Regular training in management, accounting, computer and business leadership has enhanced several of the group leaders. Renovation of the shop facilities, equipping of a storage room for the beading project have also been part of the ANA activities in the year. In March four of the leading women got to travel to Nairobi where they were introduced to the various suppliers and shops, which are essential for their businesses. Indeed an experience of a lifetime for some of them who had never been outside their county before. The opening of bank accounts for each member where salaries, bonus money and support can be transferred has also been a major business improvement. Bonus money, which is normally paid twice yearly, emanates from surplus of sale of the ANA Beading business products, particularly in Sweden. Triza Amoni is one of 9 secondary school students who have just graduated and who have been supported through the Mapendo Student Support Project (mapendo means love). As is the case for most of the other 28 secondary school students and 4 university students in the project, Triza’s family have no means to pay for her secondary education. All the students attend boarding schools and apart from school fees the support also covers all the necessities such as travel, literature, uniforms and extras. Turkana is by far the most marginalized of Kenya’s regions and every year the MSS project receives a great number of requests for support from orphaned students or families with no financial resources. 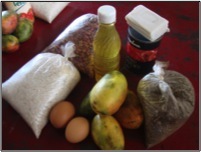 A number of children in the Hannah-Emuriakin-School come from extremely deprived families and need extra nutritional support, which is why the Birgitta’s Food Bag Program has been developed. 60 children receive this weekly supplement thanks to individual sponsors for each child. Lack of food is an everyday reality for many people in Loki but during the dry season, January – March, things can get very acute, not the least for many of the elderly. Thanks to generous gifts from individuals and organizations some 3000 households got an extra food supply in February and March. There have also been 60 old & sick people on a special weekly feeding program during the year. 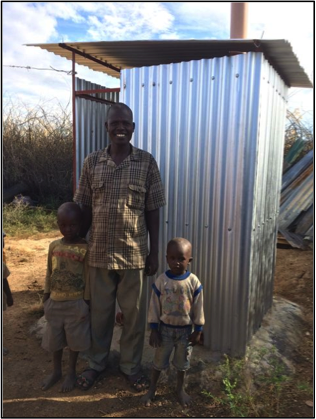 Latrines– 20 new latrines have been made and instaled and the total number, which has been distributed in various locations, now adds up to 70. A project, which has an enormous impact on health and environment! A Dental Clinic – added to the existing AIC Health Clinic and which now gives the dentist his own space to see and treat his patients. A Sewing Project – 4 women and 2 men are being trained in sewing and tailoring and they’re now making anything from aprons to dresses and shorts for girls and boys. 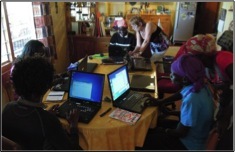 Training and Seminars – 10 people have had training to become adult literacy trainer. Other training and seminars have involved farming and leadership training for key people in the local society. And more – A church building which was about to collaps has been erected and received proper walls, windows and doors, a small primary school has received support of premises rent, some disabled have been given new wheel chairs and an extra weekly meal at a local restaurant – not to mention all the sick people who have been able to get medical help thanks to faithful support from sponsors. Our heartfelt thanks to all who have been involved during the year!